Despite racing out to a two goal lead, the Union reserves faded in the closing minutes, surrendering the lead and settling for a 2-2 tie at Widener’s Quick Stadium. Antoine Hoppenot led the line for the Union, opening the scoring in the 11th minute, having been set up by Josue Martinez. The first year striker proved a handful throughout the contest and strong set-up play from Martinez, Jack McInerney and trialist Colton Storm had the Union on the front foot though they could only put one past Jeremy Vuolo in the first half. Intent to remain dominant in the second stanza, the Union carried over their strong first half effort, quickly notching their second within a minute of the resumption of play. Clever interplay between Hoppenot and McInerney put Hoppenot in behind the Red Bulls back line where he was dragged down inside the box. McInerney comfortably dispatched the kick and the Union looked to settle into cruise control. But New York had other plans, with Walter Hines serving as the catalyst. Coming on in place of the ineffective Juan Agudelo, Hines provided the spark for the visitors and after having a chance saved, cut the lead in half in the 68th minute. With the Red Bulls applying all the pressure in the search for an equalizer, Chase Harrison continued to be sharp, keeping New York at bay as time wore down. But ultimately the pressure was too great, and Corey Hertzog slipped into the box, tapping home a rebound and earning a draw for the Red Bulls. At the heart of everything the Union attack did well, Hoppenot scored the first goal, drew the penalty for the second, and went on a marauding run that ended with a powerful near post blast off of the post. Easily outpacing the Red Bulls defense, he also showed no fear when it came to mixing it up physically. He literally threw a defender off of him to keep his run alive late in the match. If he continues to play like this, he is sure to earn time with the first team sooner than later. Captained the side and looked a confident leader throughout, calling out assignments, directing traffic and settling play in the middle of the park. His vision and ability to spread the ball led to some of the best attacking forays on the afternoon, and Okugo continues to prove his class whenever he gets on the pitch regardless of the level. Cannot be blamed for either goal, as his defense collapsed around him and gave the Red Bulls far too many opportunities to attack the net. Were it not for Harrison’s sharpness in net (he recorded 9 saves), the result could have gone to Red Bulls, perhaps by a large margin. Commanded his box well and was vocal with his defense throughout, Harrison showed the focus of a player who thought this might have been the week for his first start in MLS. If Zac MacMath ever needs to sit out a match, Harrison appears ready. After looking sharp and clever on the ball against Schalke in midweek, Pfeffer was largely invisible over the 90 minutes against the Red Bulls on Sunday. With a touch that was heavier than normal, Pfeffer dallied too long in possession and failed to make the incisive runs that define his play when he is on song. With the day likely just a blip on the radar, Pfeffer still must find more consistency as he matures to be a first choice player. Yet to get off the mark in 2012, Hernandez continues to look out of sorts. Whether it’s a heavy touch, taking too long to read a play, or getting beat by an attacker, the homegrown player that announced himself with a match-winner against Everton in 2011 hasn’t looked like a future MLSer in 2012. Still, he is still only 18, and different players adjust to new positions at different speeds. It does seem unfortunate that the Union have elected to change his position to increase defensive cover rather than simply acquiring an appropriate amount of true defenders. Things just aren’t working out for the Costa Rican in MLS. Playing at center back, Lopez started the match confidently for the reserves but faded badly as the minutes wore on. As the oldest outfield player on the pitch, Lopez should have led the back line as they attempted to grind out a result. Instead, he was struggling too much with his own game to help his less experienced teammates. Matched against young, quick attackers, Lopez was found wanting for pace, and his touch and passing simply are not up to par for an MLS-caliber fullback. Like this extra report and format for it as well. Good to meet Eli and Daniel at the reserve game, top men! Spot on call for Hoppenot, as he’s been easily the most impressive player for the Union in the three reserve matches I’ve attended. His motor never stops and the Princeton alum always looks capable of putting the ball in the net for the Union. It was also good to see the Reading United boys show well at Quick. 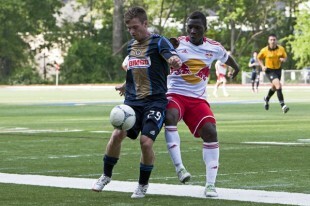 Hertzog netted for NYRB and Vuolo played well in goal. All around a great afternoon of soccer. Union fans, get yourself to a reserve match. You will not be disappointed! I second that. Reserve matches are great free fun. It’s also interesting to hear what the on-field communication sounds like during a match when there isn’t an enormous crowd drowning it out. Good times. For the record, Agudelo is one dirty, dirty player. The ref was a little start struck or he would have sent Agudelo off at least twice, once for an elbow and once for kicking out at a Union player. The game was played in a pretty good spirit, but anytime anyone put a body on Agudelo, he pulled the prima donna card. Yadda, yadda yadda. What I want to know is what happened to your tie? No sweater is fine but we’re not running a bawdy house here, mister. That’s $5 in the discipline jar, you know the rules. Brendan Burke is awesome by the way. Future Union manager…? Agreed – He was very informative in the Q&A we did with him last year. He’s one very hard working dude. I’m from Reading and have been to countless Reading United games (even before when they were the Reading Rage) and cheered with the Locos – United’s supporters group – so I’ve had the privilege of meeting and talking with Brendan several times. He is so smart when it comes to soccer and breaking down and analyzing games. He will make a GREAT manager someday, and I really hope it’s with the Union. Beyond that, he’s just an awesome guy.